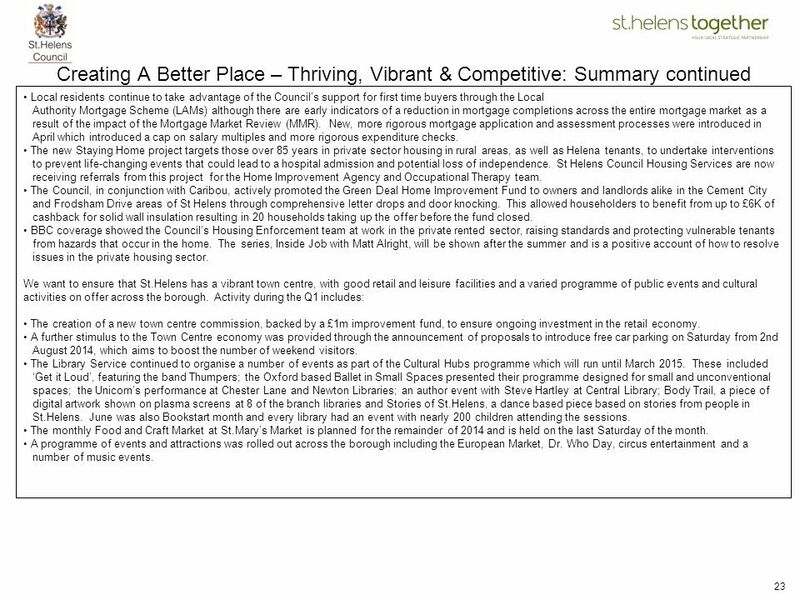 3 Introduction This is the St.Helens Plan Performance Report for the 1st Quarter The purpose of the report is to monitor progress against the delivery of the priorities and performance measures contained in the St.Helens Plan The agreed priorities and associated performance measures are based on the twin themes of ‘People and Place’. 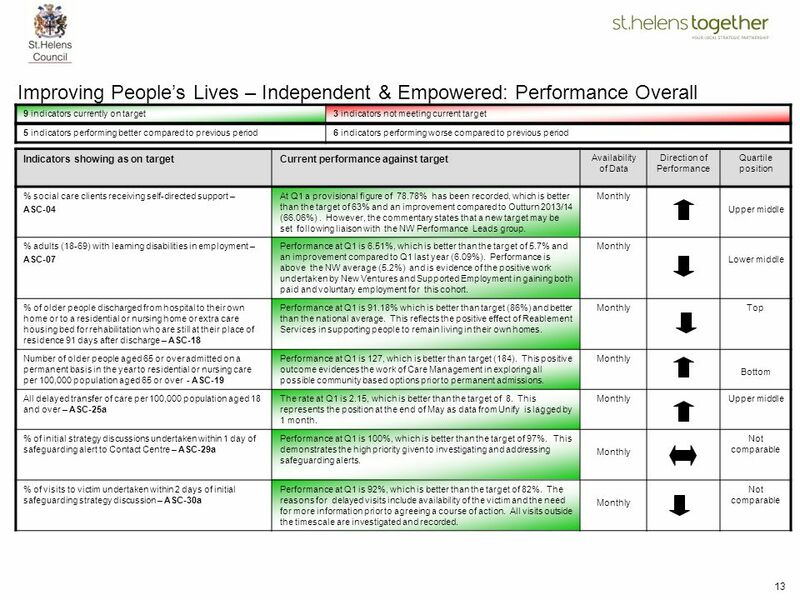 The report contains: An overview of the performance of indicators contained within the St.Helens Plan, examining progress against target and improvement over time. A summary statement for each of the 6 priority areas, outlining significant issues around service delivery, be it notable performance, challenges, concerns, and key action being undertaken to improve delivery or performance. 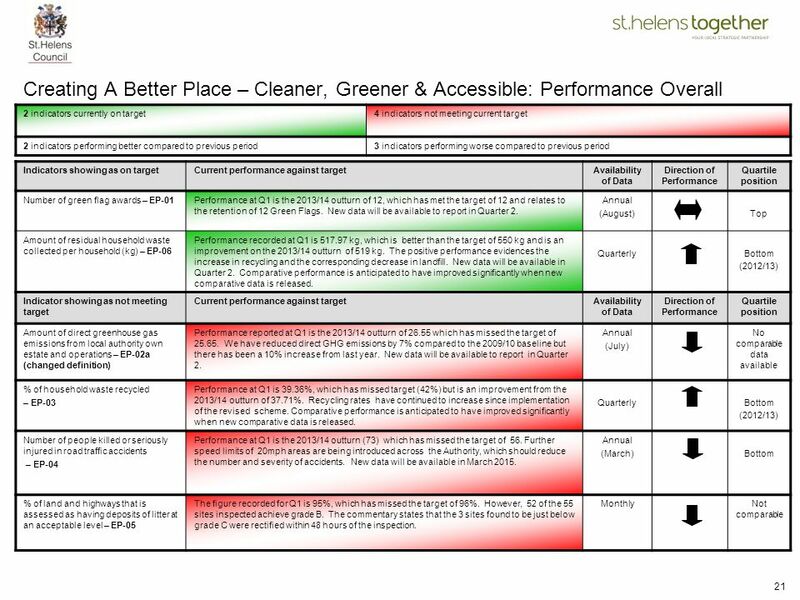 A table showing the overall performance of indicators for each of the 6 priority areas. Contributions to the narrative sections of this report are welcomed from all partners. Contributions can be sent at the end of each quarter to Note on performance analysis Direction of performance is determined individually for each PI, identifying whether performance has improved ↑, remained the same ↔, or worsened ↓ relative to the degree of variance from target in the current reporting period compared to the period when data was last available, be it monthly, quarterly or annually. Where reference is provided to the comparative quartile performance of an indicator, the data used to calculate the quartile position is the latest available for the relevant family / nearest neighbour group. Requests for further information in relation to comparative performance can be made to Further details of all our indicators are available in the Performance Indicator Database 2014/15. 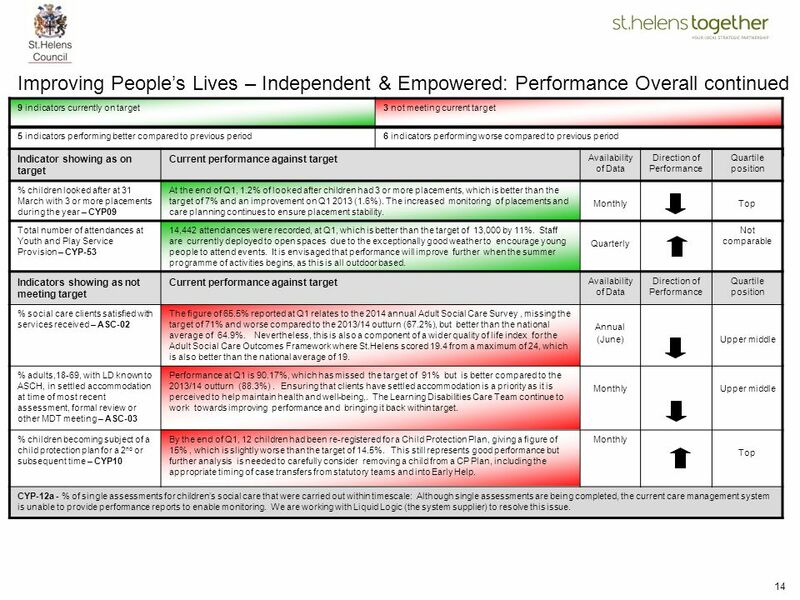 The following pie charts show the overall performance and direction of travel of all the performance indicators contained in the St.Helens Plan as key measures of success. 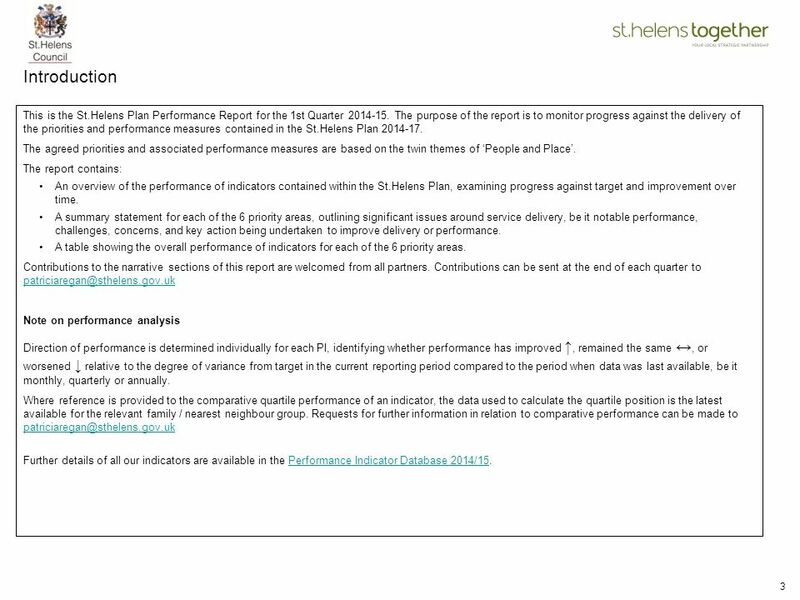 There are a total of 48 performance indicators contained within the Plan and details of the individual indicator performance can be found in the Council’s Performance Indicator Database 2014/15. PIs improving = 22 PIs worsening = 21 PIs unchanged = 2 PIs on target = 26 PIs off target = 20 It is not possible to assess direction of travel for 3 PIs At the end of June 2014, 26, or 57%, of performance indicators were on or above target. There were data gaps for two indicators (CYP-12a - % of single assessments for children's social care that were carried out within timescale; and PH-03a – Number of people quitting smoking). These indicators have been excluded in the calculation above for Ps on and off target. There were 3 performance indicators where direction of travel could not be assessed as these are either new or revised indicators with no previous data to compare against. These indicators have been excluded from the calculations in the above chart. Of the 45 indicators where it is possible to assess direction of travel, 22 or 49%, showed improvement. 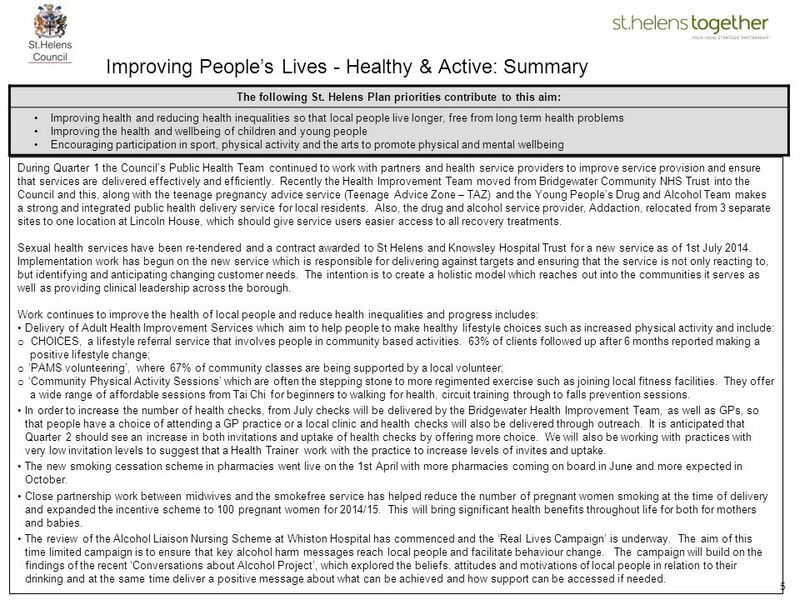 The following St. Helens Plan priorities contribute to this aim: Improving health and reducing health inequalities so that local people live longer, free from long term health problems Improving the health and wellbeing of children and young people Encouraging participation in sport, physical activity and the arts to promote physical and mental wellbeing During Quarter 1 the Council’s Public Health Team continued to work with partners and health service providers to improve service provision and ensure that services are delivered effectively and efficiently. Recently the Health Improvement Team moved from Bridgewater Community NHS Trust into the Council and this, along with the teenage pregnancy advice service (Teenage Advice Zone – TAZ) and the Young People’s Drug and Alcohol Team makes a strong and integrated public health delivery service for local residents. Also, the drug and alcohol service provider, Addaction, relocated from 3 separate sites to one location at Lincoln House, which should give service users easier access to all recovery treatments. Sexual health services have been re-tendered and a contract awarded to St Helens and Knowsley Hospital Trust for a new service as of 1st July Implementation work has begun on the new service which is responsible for delivering against targets and ensuring that the service is not only reacting to, but identifying and anticipating changing customer needs. The intention is to create a holistic model which reaches out into the communities it serves as well as providing clinical leadership across the borough. 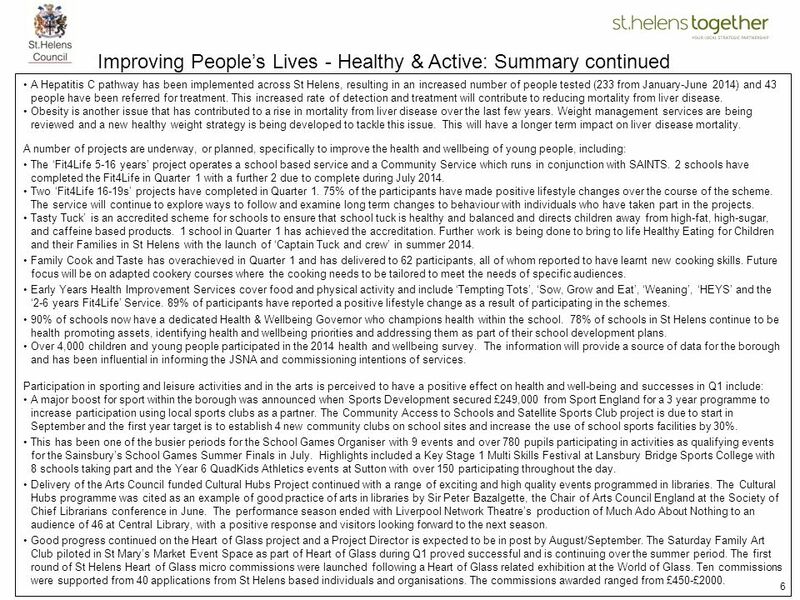 Work continues to improve the health of local people and reduce health inequalities and progress includes: Delivery of Adult Health Improvement Services which aim to help people to make healthy lifestyle choices such as increased physical activity and include: CHOICES, a lifestyle referral service that involves people in community based activities. 63% of clients followed up after 6 months reported making a positive lifestyle change; ‘PAMS volunteering’, where 67% of community classes are being supported by a local volunteer; ‘Community Physical Activity Sessions’ which are often the stepping stone to more regimented exercise such as joining local fitness facilities. They offer a wide range of affordable sessions from Tai Chi for beginners to walking for health, circuit training through to falls prevention sessions. In order to increase the number of health checks, from July checks will be delivered by the Bridgewater Health Improvement Team, as well as GPs, so that people have a choice of attending a GP practice or a local clinic and health checks will also be delivered through outreach. It is anticipated that Quarter 2 should see an increase in both invitations and uptake of health checks by offering more choice. We will also be working with practices with very low invitation levels to suggest that a Health Trainer work with the practice to increase levels of invites and uptake. The new smoking cessation scheme in pharmacies went live on the 1st April with more pharmacies coming on board in June and more expected in October. Close partnership work between midwives and the smokefree service has helped reduce the number of pregnant women smoking at the time of delivery and expanded the incentive scheme to 100 pregnant women for 2014/15. This will bring significant health benefits throughout life for both for mothers and babies. The review of the Alcohol Liaison Nursing Scheme at Whiston Hospital has commenced and the ‘Real Lives Campaign’ is underway. The aim of this time limited campaign is to ensure that key alcohol harm messages reach local people and facilitate behaviour change. The campaign will build on the findings of the recent ‘Conversations about Alcohol Project’, which explored the beliefs, attitudes and motivations of local people in relation to their drinking and at the same time deliver a positive message about what can be achieved and how support can be accessed if needed. A Hepatitis C pathway has been implemented across St Helens, resulting in an increased number of people tested (233 from January-June 2014) and 43 people have been referred for treatment. This increased rate of detection and treatment will contribute to reducing mortality from liver disease. Obesity is another issue that has contributed to a rise in mortality from liver disease over the last few years. Weight management services are being reviewed and a new healthy weight strategy is being developed to tackle this issue. This will have a longer term impact on liver disease mortality. A number of projects are underway, or planned, specifically to improve the health and wellbeing of young people, including: The ‘Fit4Life 5-16 years’ project operates a school based service and a Community Service which runs in conjunction with SAINTS. 2 schools have completed the Fit4Life in Quarter 1 with a further 2 due to complete during July 2014. Two ‘Fit4Life 16-19s’ projects have completed in Quarter 1. 75% of the participants have made positive lifestyle changes over the course of the scheme. The service will continue to explore ways to follow and examine long term changes to behaviour with individuals who have taken part in the projects. Tasty Tuck’ is an accredited scheme for schools to ensure that school tuck is healthy and balanced and directs children away from high-fat, high-sugar, and caffeine based products. 1 school in Quarter 1 has achieved the accreditation. Further work is being done to bring to life Healthy Eating for Children and their Families in St Helens with the launch of ‘Captain Tuck and crew’ in summer 2014. Family Cook and Taste has overachieved in Quarter 1 and has delivered to 62 participants, all of whom reported to have learnt new cooking skills. Future focus will be on adapted cookery courses where the cooking needs to be tailored to meet the needs of specific audiences. Early Years Health Improvement Services cover food and physical activity and include ‘Tempting Tots’, ‘Sow, Grow and Eat’, ‘Weaning’, ‘HEYS’ and the ‘2-6 years Fit4Life’ Service. 89% of participants have reported a positive lifestyle change as a result of participating in the schemes. 90% of schools now have a dedicated Health & Wellbeing Governor who champions health within the school. 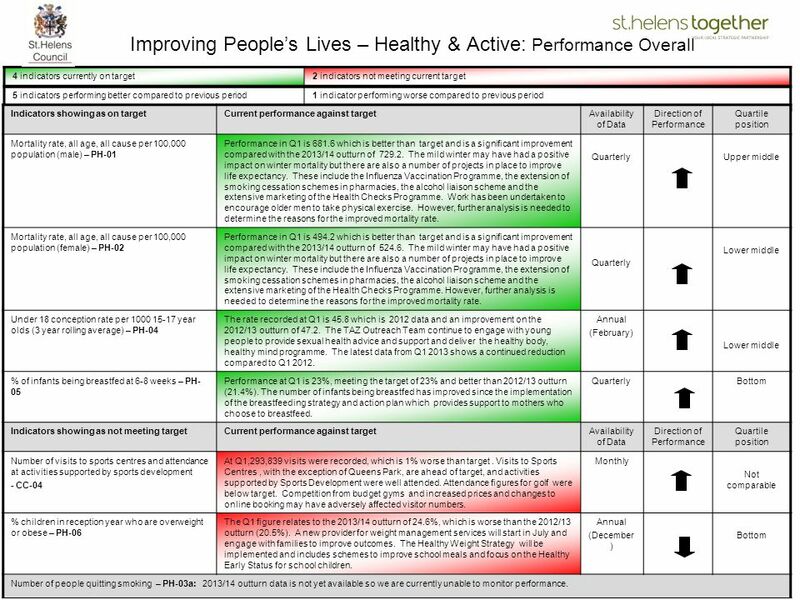 78% of schools in St Helens continue to be health promoting assets, identifying health and wellbeing priorities and addressing them as part of their school development plans. Over 4,000 children and young people participated in the 2014 health and wellbeing survey. The information will provide a source of data for the borough and has been influential in informing the JSNA and commissioning intentions of services. Participation in sporting and leisure activities and in the arts is perceived to have a positive effect on health and well-being and successes in Q1 include: A major boost for sport within the borough was announced when Sports Development secured £249,000 from Sport England for a 3 year programme to increase participation using local sports clubs as a partner. The Community Access to Schools and Satellite Sports Club project is due to start in September and the first year target is to establish 4 new community clubs on school sites and increase the use of school sports facilities by 30%. This has been one of the busier periods for the School Games Organiser with 9 events and over 780 pupils participating in activities as qualifying events for the Sainsbury’s School Games Summer Finals in July. Highlights included a Key Stage 1 Multi Skills Festival at Lansbury Bridge Sports College with 8 schools taking part and the Year 6 QuadKids Athletics events at Sutton with over 150 participating throughout the day. Delivery of the Arts Council funded Cultural Hubs Project continued with a range of exciting and high quality events programmed in libraries. The Cultural Hubs programme was cited as an example of good practice of arts in libraries by Sir Peter Bazalgette, the Chair of Arts Council England at the Society of Chief Librarians conference in June. The performance season ended with Liverpool Network Theatre’s production of Much Ado About Nothing to an audience of 46 at Central Library, with a positive response and visitors looking forward to the next season. Good progress continued on the Heart of Glass project and a Project Director is expected to be in post by August/September. The Saturday Family Art Club piloted in St Mary’s Market Event Space as part of Heart of Glass during Q1 proved successful and is continuing over the summer period. The first round of St Helens Heart of Glass micro commissions were launched following a Heart of Glass related exhibition at the World of Glass. 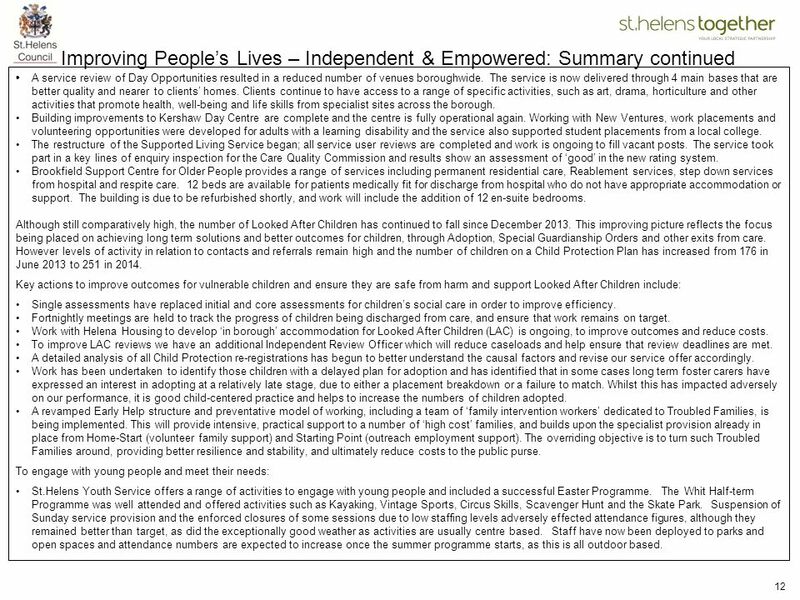 Ten commissions were supported from 40 applications from St Helens based individuals and organisations. The commissions awarded ranged from £450-£2000. 4 indicators currently on target 2 indicators not meeting current target 5 indicators performing better compared to previous period 1 indicator performing worse compared to previous period Indicators showing as on target Current performance against target Availability of Data Direction of Performance Quartile position Mortality rate, all age, all cause per 100,000 population (male) – PH-01 Performance in Q1 is which is better than target and is a significant improvement compared with the 2013/14 outturn of The mild winter may have had a positive impact on winter mortality but there are also a number of projects in place to improve life expectancy. These include the Influenza Vaccination Programme, the extension of smoking cessation schemes in pharmacies, the alcohol liaison scheme and the extensive marketing of the Health Checks Programme. Work has been undertaken to encourage older men to take physical exercise. However, further analysis is needed to determine the reasons for the improved mortality rate. Quarterly Upper middle Mortality rate, all age, all cause per 100,000 population (female) – PH-02 Performance in Q1 is which is better than target and is a significant improvement compared with the 2013/14 outturn of The mild winter may have had a positive impact on winter mortality but there are also a number of projects in place to improve life expectancy. These include the Influenza Vaccination Programme, the extension of smoking cessation schemes in pharmacies, the alcohol liaison scheme and the extensive marketing of the Health Checks Programme. However, further analysis is needed to determine the reasons for the improved mortality rate. Lower middle Under 18 conception rate per year olds (3 year rolling average) – PH-04 The rate recorded at Q1 is 45.8 which is data and an improvement on the 2012/13 outturn of The TAZ Outreach Team continue to engage with young people to provide sexual health advice and support and deliver the healthy body, healthy mind programme. The latest data from Q shows a continued reduction compared to Q Annual (February) % of infants being breastfed at 6-8 weeks – PH-05 Performance at Q1 is 23%, meeting the target of 23% and better than 2012/13 outturn (21.4%). The number of infants being breastfed has improved since the implementation of the breastfeeding strategy and action plan which provides support to mothers who choose to breastfeed. Bottom Indicators showing as not meeting target Number of visits to sports centres and attendance at activities supported by sports development - CC-04 At Q1,293,839 visits were recorded, which is 1% worse than target . Visits to Sports Centres , with the exception of Queens Park, are ahead of target, and activities supported by Sports Development were well attended. Attendance figures for golf were below target. Competition from budget gyms and increased prices and changes to online booking may have adversely affected visitor numbers. Monthly Not comparable % children in reception year who are overweight or obese – PH-06 The Q1 figure relates to the 2013/14 outturn of 24.6%, which is worse than the 2012/13 outturn (20.5%). A new provider for weight management services will start in July and engage with families to improve outcomes. The Healthy Weight Strategy will be implemented and includes schemes to improve school meals and focus on the Healthy Early Status for school children. (December) Number of people quitting smoking – PH-03a: /14 outturn data is not yet available so we are currently unable to monitor performance. applications into the main allocation, whilst other LAs put them aside and only allocate places after the main allocation (which these comparative figures are based on) is completed. Our process provides a more customer focused and efficient service but means that our figures will be comparatively lower than other LAs who build the late applications in after this data is collated. Furthermore, the LAs who achieved a higher percentage of 1st Preferences in Primary Schools had higher variances between applications received and places available, suggesting increased surplus capacity. 95.8% of secondary school applicants in St.Helens secured a place for September 2014 in their 1st Preference school, which was the 3rd highest in the North West and above the national average of 85.2%. This was despite 5 of our 9 secondary schools being oversubscribed. 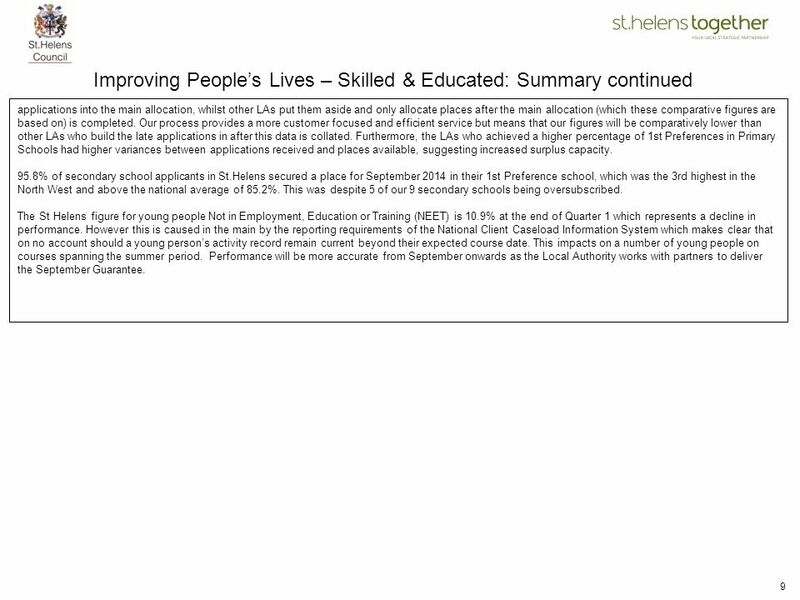 The St Helens figure for young people Not in Employment, Education or Training (NEET) is 10.9% at the end of Quarter 1 which represents a decline in performance. However this is caused in the main by the reporting requirements of the National Client Caseload Information System which makes clear that on no account should a young person’s activity record remain current beyond their expected course date. This impacts on a number of young people on courses spanning the summer period. Performance will be more accurate from September onwards as the Local Authority works with partners to deliver the September Guarantee. The following St. Helens Plan priorities contribute to this aim: Working across health and social care to support vulnerable adults to improve their quality of life and to live independently through personalised, accessible and inclusive social services Ensuring that children and vulnerable adults are safe from harm Ensuring that children in care and care leavers achieve their full potential Engaging and meeting the needs of all local young people The Care Act 2014 represents the most significant reform of social care in recent years, and includes changes to underpinning legislation, legibility criteria, funding and Adult Safeguarding. Following the receipt of a grant to support the implementation of the Care Act, a Service Manager has been appointed to lead and co-ordinate this activity. The Partnership will continue to assess the proposed changes that will arise from the Care Act. 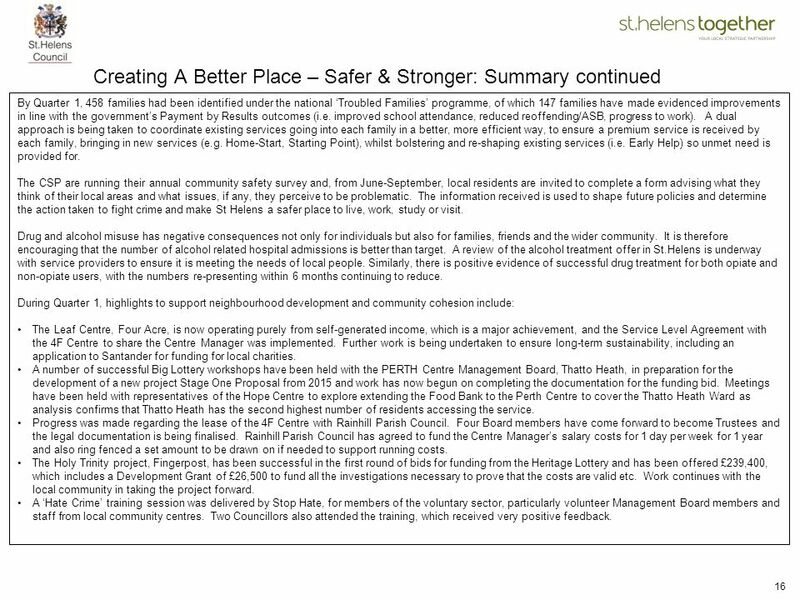 The Better Care Fund (BCF) will also be a major focus of work between St. Helens Council and CCG during 2014/15. The BCF is government funding to ensure the transformation into integrated Health and Social Care, through the introduction of a single pooled budget to support services to work more closely together. 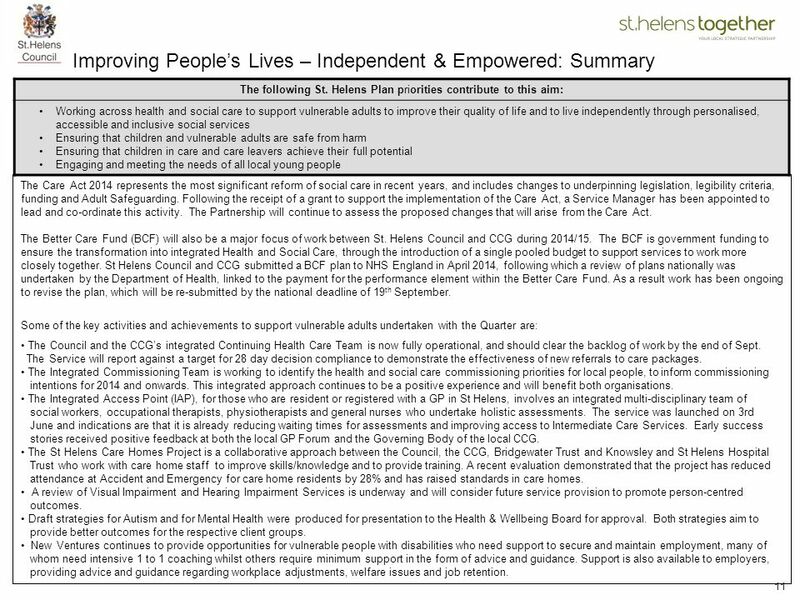 St Helens Council and CCG submitted a BCF plan to NHS England in April 2014, following which a review of plans nationally was undertaken by the Department of Health, linked to the payment for the performance element within the Better Care Fund. As a result work has been ongoing to revise the plan, which will be re-submitted by the national deadline of 19th September. Some of the key activities and achievements to support vulnerable adults undertaken with the Quarter are: •	The Council and the CCG’s integrated Continuing Health Care Team is now fully operational, and should clear the backlog of work by the end of Sept. The Service will report against a target for 28 day decision compliance to demonstrate the effectiveness of new referrals to care packages. •	The Integrated Commissioning Team is working to identify the health and social care commissioning priorities for local people, to inform commissioning intentions for 2014 and onwards. This integrated approach continues to be a positive experience and will benefit both organisations. •	The Integrated Access Point (IAP), for those who are resident or registered with a GP in St Helens, involves an integrated multi-disciplinary team of social workers, occupational therapists, physiotherapists and general nurses who undertake holistic assessments. The service was launched on 3rd June and indications are that it is already reducing waiting times for assessments and improving access to Intermediate Care Services. Early success stories received positive feedback at both the local GP Forum and the Governing Body of the local CCG. •	The St Helens Care Homes Project is a collaborative approach between the Council, the CCG, Bridgewater Trust and Knowsley and St Helens Hospital Trust who work with care home staff to improve skills/knowledge and to provide training. A recent evaluation demonstrated that the project has reduced attendance at Accident and Emergency for care home residents by 28% and has raised standards in care homes. •	A review of Visual Impairment and Hearing Impairment Services is underway and will consider future service provision to promote person-centred outcomes. •	Draft strategies for Autism and for Mental Health were produced for presentation to the Health & Wellbeing Board for approval. Both strategies aim to provide better outcomes for the respective client groups. New Ventures continues to provide opportunities for vulnerable people with disabilities who need support to secure and maintain employment, many of whom need intensive 1 to 1 coaching whilst others require minimum support in the form of advice and guidance. Support is also available to employers, providing advice and guidance regarding workplace adjustments, welfare issues and job retention. •	A service review of Day Opportunities resulted in a reduced number of venues boroughwide. The service is now delivered through 4 main bases that are better quality and nearer to clients’ homes. Clients continue to have access to a range of specific activities, such as art, drama, horticulture and other activities that promote health, well-being and life skills from specialist sites across the borough. •	Building improvements to Kershaw Day Centre are complete and the centre is fully operational again. Working with New Ventures, work placements and volunteering opportunities were developed for adults with a learning disability and the service also supported student placements from a local college. •	The restructure of the Supported Living Service began; all service user reviews are completed and work is ongoing to fill vacant posts. The service took part in a key lines of enquiry inspection for the Care Quality Commission and results show an assessment of ‘good’ in the new rating system. •	Brookfield Support Centre for Older People provides a range of services including permanent residential care, Reablement services, step down services from hospital and respite care. 12 beds are available for patients medically fit for discharge from hospital who do not have appropriate accommodation or support. The building is due to be refurbished shortly, and work will include the addition of 12 en-suite bedrooms. Although still comparatively high, the number of Looked After Children has continued to fall since December This improving picture reflects the focus being placed on achieving long term solutions and better outcomes for children, through Adoption, Special Guardianship Orders and other exits from care. However levels of activity in relation to contacts and referrals remain high and the number of children on a Child Protection Plan has increased from 176 in June 2013 to 251 in 2014. Key actions to improve outcomes for vulnerable children and ensure they are safe from harm and support Looked After Children include: •	Single assessments have replaced initial and core assessments for children’s social care in order to improve efficiency. •	Fortnightly meetings are held to track the progress of children being discharged from care, and ensure that work remains on target. •	Work with Helena Housing to develop ‘in borough’ accommodation for Looked After Children (LAC) is ongoing, to improve outcomes and reduce costs. •	To improve LAC reviews we have an additional Independent Review Officer which will reduce caseloads and help ensure that review deadlines are met. •	A detailed analysis of all Child Protection re-registrations has begun to better understand the causal factors and revise our service offer accordingly. •	Work has been undertaken to identify those children with a delayed plan for adoption and has identified that in some cases long term foster carers have expressed an interest in adopting at a relatively late stage, due to either a placement breakdown or a failure to match. Whilst this has impacted adversely on our performance, it is good child-centered practice and helps to increase the numbers of children adopted. •	A revamped Early Help structure and preventative model of working, including a team of ‘family intervention workers’ dedicated to Troubled Families, is being implemented. This will provide intensive, practical support to a number of ‘high cost’ families, and builds upon the specialist provision already in place from Home-Start (volunteer family support) and Starting Point (outreach employment support). The overriding objective is to turn such Troubled Families around, providing better resilience and stability, and ultimately reduce costs to the public purse. To engage with young people and meet their needs: •	St.Helens Youth Service offers a range of activities to engage with young people and included a successful Easter Programme. The Whit Half-term Programme was well attended and offered activities such as Kayaking, Vintage Sports, Circus Skills, Scavenger Hunt and the Skate Park. Suspension of Sunday service provision and the enforced closures of some sessions due to low staffing levels adversely effected attendance figures, although they remained better than target, as did the exceptionally good weather as activities are usually centre based. Staff have now been deployed to parks and open spaces and attendance numbers are expected to increase once the summer programme starts, as this is all outdoor based. Improving People’s Lives – Independent & Empowered: Performance Overall 9 indicators currently on target 3 indicators not meeting current target 5 indicators performing better compared to previous period 6 indicators performing worse compared to previous period Indicators showing as on target Current performance against target Availability of Data Direction of Performance Quartile position % social care clients receiving self-directed support – ASC-04 At Q1 a provisional figure of % has been recorded, which is better than the target of 63% and an improvement compared to Outturn 2013/14 (66.06%) . However, the commentary states that a new target may be set following liaison with the NW Performance Leads group. Monthly Upper middle % adults (18-69) with learning disabilities in employment – ASC-07 Performance at Q1 is 6.51%, which is better than the target of 5.7% and an improvement compared to Q1 last year (6.09%). Performance is above the NW average (5.2%) and is evidence of the positive work undertaken by New Ventures and Supported Employment in gaining both paid and voluntary employment for this cohort. Lower middle % of older people discharged from hospital to their own home or to a residential or nursing home or extra care housing bed for rehabilitation who are still at their place of residence 91 days after discharge – ASC-18 Performance at Q1 is 91.18% which is better than target (86%) and better than the national average. This reflects the positive effect of Reablement Services in supporting people to remain living in their own homes. Top Number of older people aged 65 or over admitted on a permanent basis in the year to residential or nursing care per 100,000 population aged 65 or over - ASC-19 Performance at Q1 is 127, which is better than target (184). This positive outcome evidences the work of Care Management in exploring all possible community based options prior to permanent admissions. Bottom All delayed transfer of care per 100,000 population aged 18 and over – ASC-25a The rate at Q1 is 2.15, which is better than the target of 8. This represents the position at the end of May as data from Unify is lagged by 1 month. % of initial strategy discussions undertaken within 1 day of safeguarding alert to Contact Centre – ASC-29a Performance at Q1 is 100%, which is better than the target of 97%. This demonstrates the high priority given to investigating and addressing safeguarding alerts. Not comparable % of visits to victim undertaken within 2 days of initial safeguarding strategy discussion – ASC-30a Performance at Q1 is 92%, which is better than the target of 82%. The reasons for delayed visits include availability of the victim and the need for more information prior to agreeing a course of action. All visits outside the timescale are investigated and recorded. Improving People’s Lives – Independent & Empowered: Performance Overall continued 9 indicators currently on target 3 not meeting current target 5 indicators performing better compared to previous period 6 indicators performing worse compared to previous period Indicator showing as on target Current performance against target Availability of Data Direction of Performance Quartile position % children looked after at 31 March with 3 or more placements during the year – CYP09 At the end of Q1, 1.2% of looked after children had 3 or more placements, which is better than the target of 7% and an improvement on Q (1.6%). The increased monitoring of placements and care planning continues to ensure placement stability. Monthly Top Total number of attendances at Youth and Play Service Provision – CYP-53 14,442 attendances were recorded, at Q1, which is better than the target of 13,000 by 11%. Staff are currently deployed to open spaces due to the exceptionally good weather to encourage young people to attend events. It is envisaged that performance will improve further when the summer programme of activities begins, as this is all outdoor based. Quarterly Not comparable Indicators showing as not meeting target % social care clients satisfied with services received – ASC-02 The figure of 65.5% reported at Q1 relates to the 2014 annual Adult Social Care Survey , missing the target of 71% and worse compared to the 2013/14 outturn (67.2%), but better than the national average of 64.9%. 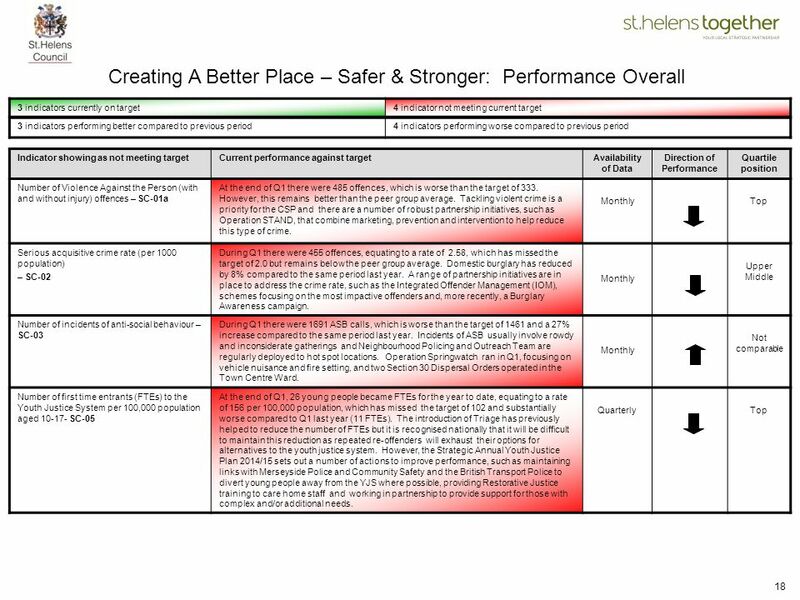 Nevertheless, this is also a component of a wider quality of life index for the Adult Social Care Outcomes Framework where St.Helens scored 19.4 from a maximum of 24, which is also better than the national average of 19. Annual (June) Upper middle % adults,18-69, with LD known to ASCH, in settled accommodation at time of most recent assessment, formal review or other MDT meeting – ASC-03 Performance at Q1 is 90.17%, which has missed the target of 91% but is better compared to the 2013/14 outturn (88.3%) . Ensuring that clients have settled accommodation is a priority as it is perceived to help maintain health and well-being,. The Learning Disabilities Care Team continue to work towards improving performance and bringing it back within target. % children becoming subject of a child protection plan for a 2nd or subsequent time – CYP10 By the end of Q1, 12 children had been re-registered for a Child Protection Plan, giving a figure of 15% , which is slightly worse than the target of 14.5%. This still represents good performance but further analysis is needed to carefully consider removing a child from a CP Plan, including the appropriate timing of case transfers from statutory teams and into Early Help. CYP-12a - % of single assessments for children’s social care that were carried out within timescale: Although single assessments are being completed, the current care management system is unable to provide performance reports to enable monitoring. We are working with Liquid Logic (the system supplier) to resolve this issue. The following St. Helens Plan priorities contribute to this aim: Reducing levels of crime, disorder and anti-social behaviour Making places feel safer for local people Reducing the level of harm caused by drug and alcohol misuse Supporting neighbourhood development and community cohesion A key issue for the coming year is the implications of the Anti-Social Behaviour, Crime and Policing Act 2014 and a report was considered by the Community Safety Partnership (CSP) in June. Reports on individual elements of the Act will be considered throughout the year. During Quarter 1 there has been a reduction in the repeat victimisation rate for domestic violence cases and evidence of good provision of support for victims of hate crime and repeat anti-social behaviour. However, Quarter 1 has seen an increase in a number of crimes relating to violent offences, serious acquisitive crime, wounding offences and the number of anti-social behaviour incidents. 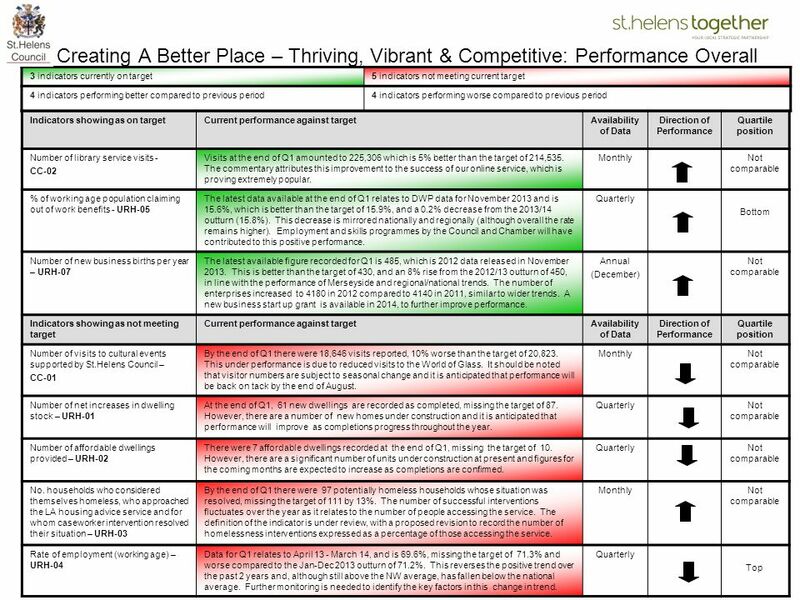 Although the borough remains better than its peer group averages in each of these areas, all were worse than target and higher than at the same period last year. A review of the multi-agency Violent Crime Strategy is in progress to identify reasons for the increase in violent crime and to identify options for dealing with this. The outcome of this review will be reported to Community Safety Partnership later in the year. A ‘Section 30’ dispersal zone came into force in April in St.Helens town centre to assist local communities and businesses to combat anti-social behaviour (ASB), and will run for 6 months. It has created a designated area where groups are not allowed to congregate if causing annoyance and intimidation and will be used alongside diversionary activities and high visibility policing to reduce incidents of ASB. For the year to date (April-June 2014), there have been 26 young people who became a First Time Entrant (FTE) to the youth justice system, a deterioration compared to 11 young people in April-June On a more positive note, only 1 young person received a custodial sentence, out of a total of 40 court disposals (2.5%) during Q1 this year which is an improvement compared to Q1 last year (14%). Also the number of FTEs recorded between January-December 2013 for St.Helens (398) compares well to the North West average of 429 and England average of 441. 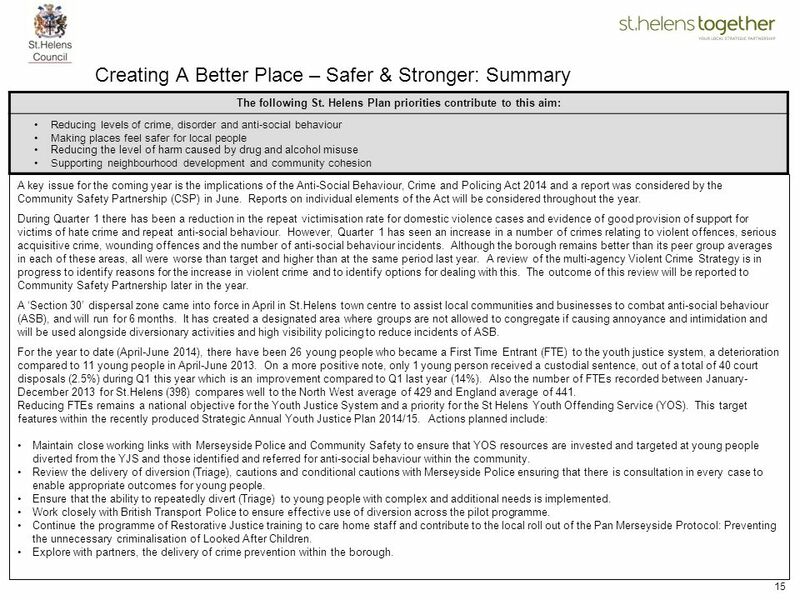 Reducing FTEs remains a national objective for the Youth Justice System and a priority for the St Helens Youth Offending Service (YOS). This target features within the recently produced Strategic Annual Youth Justice Plan 2014/15. Actions planned include: Maintain close working links with Merseyside Police and Community Safety to ensure that YOS resources are invested and targeted at young people diverted from the YJS and those identified and referred for anti-social behaviour within the community. Review the delivery of diversion (Triage), cautions and conditional cautions with Merseyside Police ensuring that there is consultation in every case to enable appropriate outcomes for young people. Ensure that the ability to repeatedly divert (Triage) to young people with complex and additional needs is implemented. Work closely with British Transport Police to ensure effective use of diversion across the pilot programme. Continue the programme of Restorative Justice training to care home staff and contribute to the local roll out of the Pan Merseyside Protocol: Preventing the unnecessary criminalisation of Looked After Children. Explore with partners, the delivery of crime prevention within the borough. By Quarter 1, 458 families had been identified under the national ‘Troubled Families’ programme, of which 147 families have made evidenced improvements in line with the government’s Payment by Results outcomes (i.e. 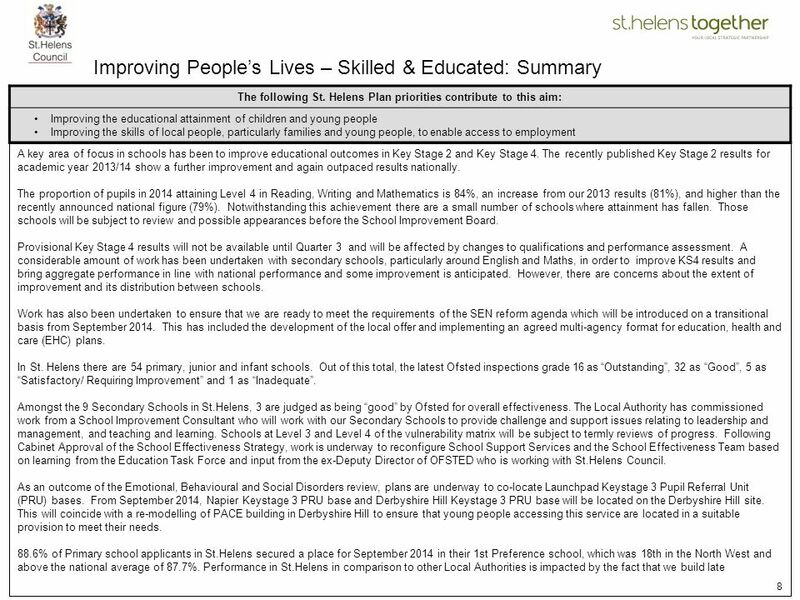 improved school attendance, reduced reoffending/ASB, progress to work). A dual approach is being taken to coordinate existing services going into each family in a better, more efficient way, to ensure a premium service is received by each family, bringing in new services (e.g. Home-Start, Starting Point), whilst bolstering and re-shaping existing services (i.e. Early Help) so unmet need is provided for. The CSP are running their annual community safety survey and, from June-September, local residents are invited to complete a form advising what they think of their local areas and what issues, if any, they perceive to be problematic. 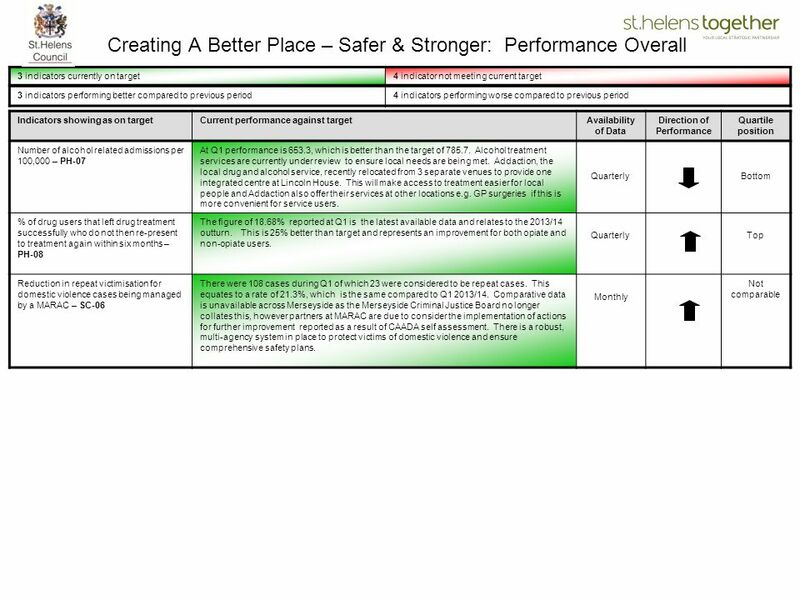 The information received is used to shape future policies and determine the action taken to fight crime and make St Helens a safer place to live, work, study or visit. Drug and alcohol misuse has negative consequences not only for individuals but also for families, friends and the wider community. It is therefore encouraging that the number of alcohol related hospital admissions is better than target. A review of the alcohol treatment offer in St.Helens is underway with service providers to ensure it is meeting the needs of local people. Similarly, there is positive evidence of successful drug treatment for both opiate and non-opiate users, with the numbers re-presenting within 6 months continuing to reduce. During Quarter 1, highlights to support neighbourhood development and community cohesion include: The Leaf Centre, Four Acre, is now operating purely from self-generated income, which is a major achievement, and the Service Level Agreement with the 4F Centre to share the Centre Manager was implemented. Further work is being undertaken to ensure long-term sustainability, including an application to Santander for funding for local charities. A number of successful Big Lottery workshops have been held with the PERTH Centre Management Board, Thatto Heath, in preparation for the development of a new project Stage One Proposal from 2015 and work has now begun on completing the documentation for the funding bid. Meetings have been held with representatives of the Hope Centre to explore extending the Food Bank to the Perth Centre to cover the Thatto Heath Ward as analysis confirms that Thatto Heath has the second highest number of residents accessing the service. Progress was made regarding the lease of the 4F Centre with Rainhill Parish Council. Four Board members have come forward to become Trustees and the legal documentation is being finalised. Rainhill Parish Council has agreed to fund the Centre Manager’s salary costs for 1 day per week for 1 year and also ring fenced a set amount to be drawn on if needed to support running costs. The Holy Trinity project, Fingerpost, has been successful in the first round of bids for funding from the Heritage Lottery and has been offered £239,400, which includes a Development Grant of £26,500 to fund all the investigations necessary to prove that the costs are valid etc. Work continues with the local community in taking the project forward. A ‘Hate Crime’ training session was delivered by Stop Hate, for members of the voluntary sector, particularly volunteer Management Board members and staff from local community centres. Two Councillors also attended the training, which received very positive feedback. 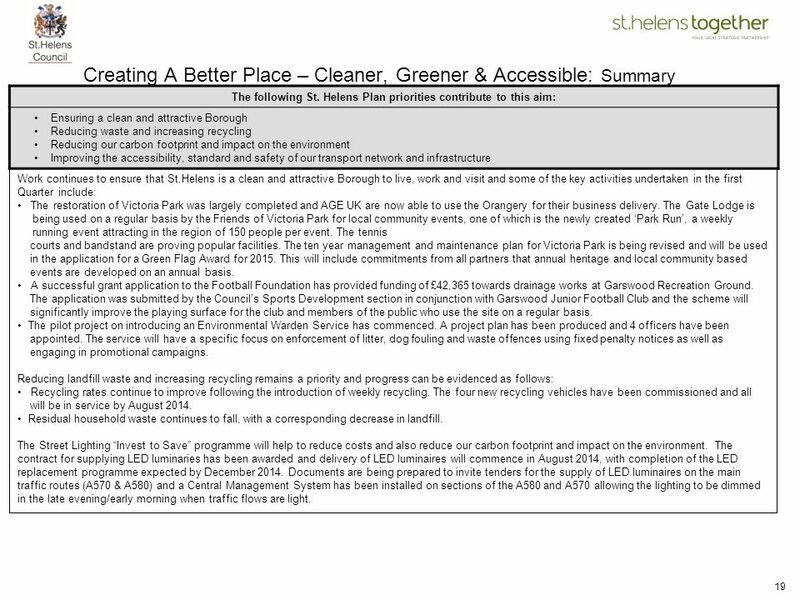 The following St. Helens Plan priorities contribute to this aim: Ensuring a clean and attractive Borough Reducing waste and increasing recycling Reducing our carbon footprint and impact on the environment Improving the accessibility, standard and safety of our transport network and infrastructure Work continues to ensure that St.Helens is a clean and attractive Borough to live, work and visit and some of the key activities undertaken in the first Quarter include: The restoration of Victoria Park was largely completed and AGE UK are now able to use the Orangery for their business delivery. The Gate Lodge is being used on a regular basis by the Friends of Victoria Park for local community events, one of which is the newly created ‘Park Run’, a weekly running event attracting in the region of 150 people per event. The tennis courts and bandstand are proving popular facilities. The ten year management and maintenance plan for Victoria Park is being revised and will be used in the application for a Green Flag Award for This will include commitments from all partners that annual heritage and local community based events are developed on an annual basis. A successful grant application to the Football Foundation has provided funding of £42,365 towards drainage works at Garswood Recreation Ground. The application was submitted by the Council’s Sports Development section in conjunction with Garswood Junior Football Club and the scheme will significantly improve the playing surface for the club and members of the public who use the site on a regular basis. The pilot project on introducing an Environmental Warden Service has commenced. A project plan has been produced and 4 officers have been appointed. The service will have a specific focus on enforcement of litter, dog fouling and waste offences using fixed penalty notices as well as engaging in promotional campaigns. Reducing landfill waste and increasing recycling remains a priority and progress can be evidenced as follows: Recycling rates continue to improve following the introduction of weekly recycling. The four new recycling vehicles have been commissioned and all will be in service by August 2014. Residual household waste continues to fall, with a corresponding decrease in landfill. The Street Lighting “Invest to Save” programme will help to reduce costs and also reduce our carbon footprint and impact on the environment. The contract for supplying LED luminaries has been awarded and delivery of LED luminaires will commence in August 2014, with completion of the LED replacement programme expected by December Documents are being prepared to invite tenders for the supply of LED luminaires on the main traffic routes (A570 & A580) and a Central Management System has been installed on sections of the A580 and A570 allowing the lighting to be dimmed in the late evening/early morning when traffic flows are light. The safety and quality of our transport network and infrastructure is another priority. At the end of March the Department for Transport announced that it was making £140 million available to local highway authorities in England to help repair damage to the local road network caused by the recent severe weather. From the £140m, £36.5m was specifically allocated to authorities who suffered severe flood damage due to the extreme weather between October 2013 and February The balance of funding (£103.5m) was made available to local highway authorities on a formula basis. 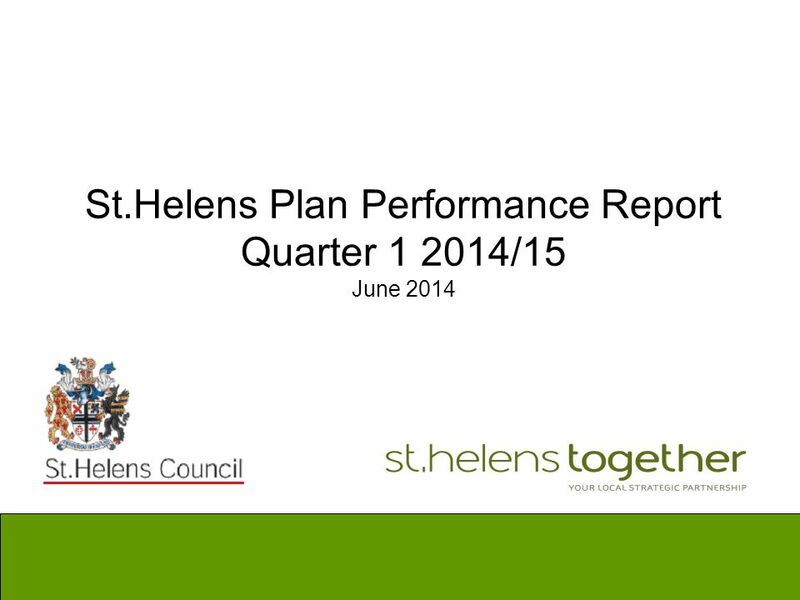 St.Helens’ allocation for 2014/15 is £252,281. The Chancellor’s Budget Statement in March announced a further £200m for 2014/15 to help address potholes and surface deterioration on the local road network. 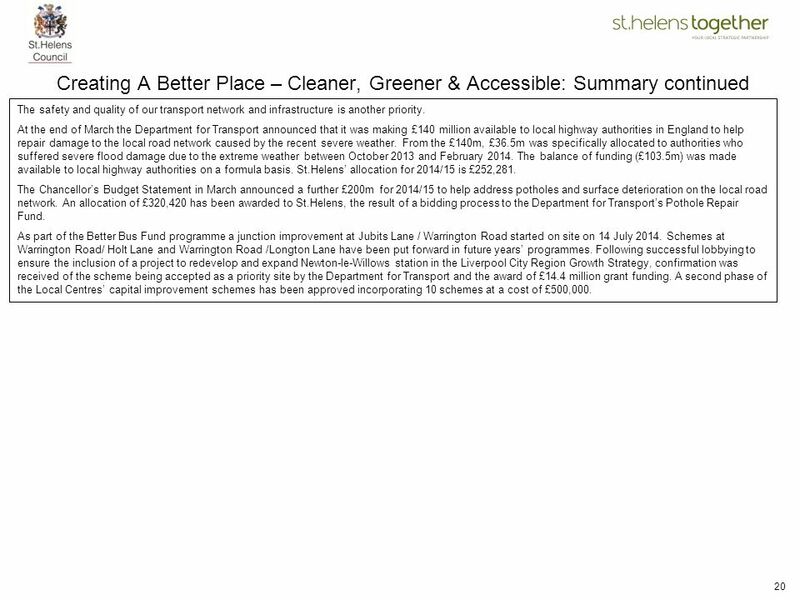 An allocation of £320,420 has been awarded to St.Helens, the result of a bidding process to the Department for Transport’s Pothole Repair Fund. As part of the Better Bus Fund programme a junction improvement at Jubits Lane / Warrington Road started on site on 14 July Schemes at Warrington Road/ Holt Lane and Warrington Road /Longton Lane have been put forward in future years’ programmes. Following successful lobbying to ensure the inclusion of a project to redevelop and expand Newton-le-Willows station in the Liverpool City Region Growth Strategy, confirmation was received of the scheme being accepted as a priority site by the Department for Transport and the award of £14.4 million grant funding. A second phase of the Local Centres’ capital improvement schemes has been approved incorporating 10 schemes at a cost of £500,000. 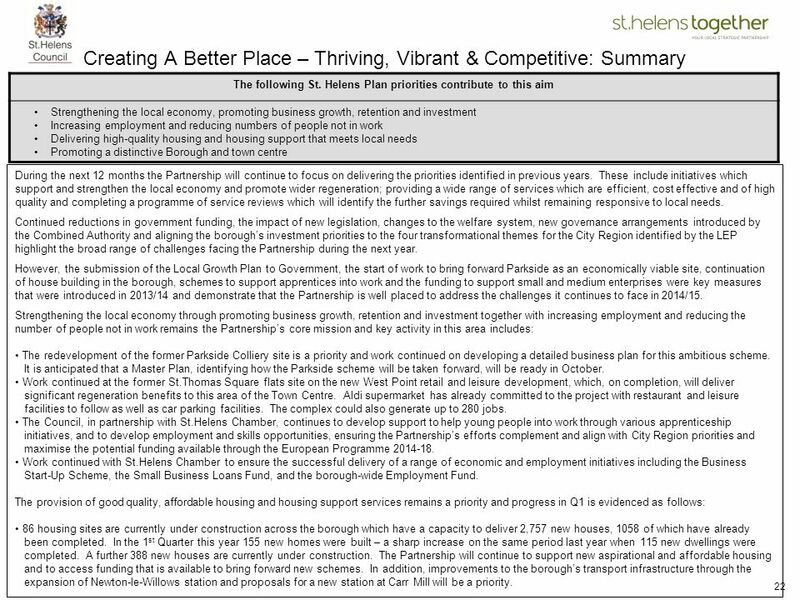 The following St. Helens Plan priorities contribute to this aim Strengthening the local economy, promoting business growth, retention and investment Increasing employment and reducing numbers of people not in work Delivering high-quality housing and housing support that meets local needs Promoting a distinctive Borough and town centre During the next 12 months the Partnership will continue to focus on delivering the priorities identified in previous years. These include initiatives which support and strengthen the local economy and promote wider regeneration; providing a wide range of services which are efficient, cost effective and of high quality and completing a programme of service reviews which will identify the further savings required whilst remaining responsive to local needs. Continued reductions in government funding, the impact of new legislation, changes to the welfare system, new governance arrangements introduced by the Combined Authority and aligning the borough’s investment priorities to the four transformational themes for the City Region identified by the LEP highlight the broad range of challenges facing the Partnership during the next year. However, the submission of the Local Growth Plan to Government, the start of work to bring forward Parkside as an economically viable site, continuation of house building in the borough, schemes to support apprentices into work and the funding to support small and medium enterprises were key measures that were introduced in 2013/14 and demonstrate that the Partnership is well placed to address the challenges it continues to face in 2014/15. Strengthening the local economy through promoting business growth, retention and investment together with increasing employment and reducing the number of people not in work remains the Partnership’s core mission and key activity in this area includes: •	The redevelopment of the former Parkside Colliery site is a priority and work continued on developing a detailed business plan for this ambitious scheme. It is anticipated that a Master Plan, identifying how the Parkside scheme will be taken forward, will be ready in October. •	Work continued at the former St.Thomas Square flats site on the new West Point retail and leisure development, which, on completion, will deliver significant regeneration benefits to this area of the Town Centre. Aldi supermarket has already committed to the project with restaurant and leisure facilities to follow as well as car parking facilities. The complex could also generate up to 280 jobs. •	The Council, in partnership with St.Helens Chamber, continues to develop support to help young people into work through various apprenticeship initiatives, and to develop employment and skills opportunities, ensuring the Partnership’s efforts complement and align with City Region priorities and maximise the potential funding available through the European Programme •	Work continued with St.Helens Chamber to ensure the successful delivery of a range of economic and employment initiatives including the Business Start-Up Scheme, the Small Business Loans Fund, and the borough-wide Employment Fund. The provision of good quality, affordable housing and housing support services remains a priority and progress in Q1 is evidenced as follows: •	86 housing sites are currently under construction across the borough which have a capacity to deliver 2,757 new houses, 1058 of which have already been completed. In the 1st Quarter this year 155 new homes were built – a sharp increase on the same period last year when 115 new dwellings were completed. A further 388 new houses are currently under construction. The Partnership will continue to support new aspirational and affordable housing and to access funding that is available to bring forward new schemes. In addition, improvements to the borough’s transport infrastructure through the expansion of Newton-le-Willows station and proposals for a new station at Carr Mill will be a priority. •	Local residents continue to take advantage of the Council’s support for first time buyers through the Local Authority Mortgage Scheme (LAMs) although there are early indicators of a reduction in mortgage completions across the entire mortgage market as a result of the impact of the Mortgage Market Review (MMR). New, more rigorous mortgage application and assessment processes were introduced in April which introduced a cap on salary multiples and more rigorous expenditure checks. •	The new Staying Home project targets those over 85 years in private sector housing in rural areas, as well as Helena tenants, to undertake interventions to prevent life-changing events that could lead to a hospital admission and potential loss of independence. St Helens Council Housing Services are now receiving referrals from this project for the Home Improvement Agency and Occupational Therapy team. •	The Council, in conjunction with Caribou, actively promoted the Green Deal Home Improvement Fund to owners and landlords alike in the Cement City and Frodsham Drive areas of St Helens through comprehensive letter drops and door knocking. This allowed householders to benefit from up to £6K of cashback for solid wall insulation resulting in 20 households taking up the offer before the fund closed. •	BBC coverage showed the Council’s Housing Enforcement team at work in the private rented sector, raising standards and protecting vulnerable tenants from hazards that occur in the home. The series, Inside Job with Matt Alright, will be shown after the summer and is a positive account of how to resolve issues in the private housing sector. We want to ensure that St.Helens has a vibrant town centre, with good retail and leisure facilities and a varied programme of public events and cultural activities on offer across the borough. Activity during the Q1 includes: •	The creation of a new town centre commission, backed by a £1m improvement fund, to ensure ongoing investment in the retail economy. •	A further stimulus to the Town Centre economy was provided through the announcement of proposals to introduce free car parking on Saturday from 2nd August 2014, which aims to boost the number of weekend visitors. •	The Library Service continued to organise a number of events as part of the Cultural Hubs programme which will run until March These included ‘Get it Loud’, featuring the band Thumpers; the Oxford based Ballet in Small Spaces presented their programme designed for small and unconventional spaces; the Unicorn’s performance at Chester Lane and Newton Libraries; an author event with Steve Hartley at Central Library; Body Trail, a piece of digital artwork shown on plasma screens at 8 of the branch libraries and Stories of St.Helens, a dance based piece based on stories from people in St.Helens. June was also Bookstart month and every library had an event with nearly 200 children attending the sessions. •	The monthly Food and Craft Market at St.Mary’s Market is planned for the remainder of 2014 and is held on the last Saturday of the month. •	A programme of events and attractions was rolled out across the borough including the European Market, Dr. Who Day, circus entertainment and a number of music events. 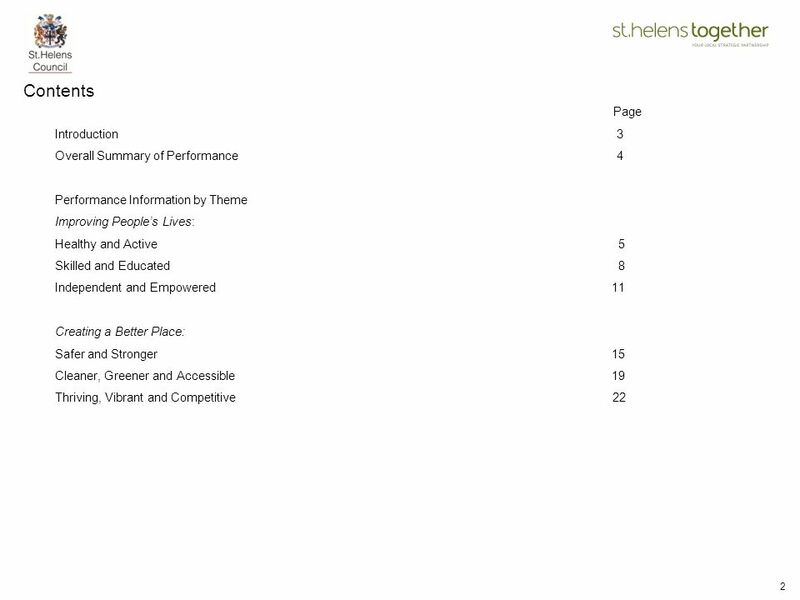 Download ppt "St.Helens Plan Performance Report Quarter /15 June 2014"
Independent schools inspection annual conferences 2014 Bradley Simmons, National Director, Independent schools John Seal HMI, Special Advisor to Independent. Leading the future of the Family Nurse Partnership: Transition Alex Morton 4 November 2014. A. Support for key statutory services Grants ProgrammesFunding CategoriesCriteria 2. Youth Work Chart of Grant Programmes, Funding Categories and Priority. Improving Life Chances in Salford Transitions from education to adult life SSP Executive – Thursday 8 December 2011 Nick Page, Strategic Director Children’s. Disability and special educational needs: local area responsibilities under the Children and Families Act, 2014 Charlie Henry HMI National lead for disability. Understanding how commissioners work, and the ways in which HITs can influence their decisions Louise Rickitt & Mel Green June 2015. Care Act Norfolk Older Peoples Strategic Partnership Board 18 June 2014 Janice Dane, Assistant Director Prevention and Transformation. Our Roles and Responsibilities Towards Young Carers Whole Family Working: Making It Real for Young Carers. The Joint Strategic Plan for Older People An overview. SEN and Disability Green Paper Pathfinders March 2012 Update. LAA Performance Review 2008 - 2009. Stretch Targets – Summary 72%On target for full reward 5.5% (1) Some reward Achieving more than 60% of difference.